Proven “go-anywhere” off-road Armoured Truck. Versatile container-lock system of load bodies. •	Choice of Load Bodies which are secured with container locks. 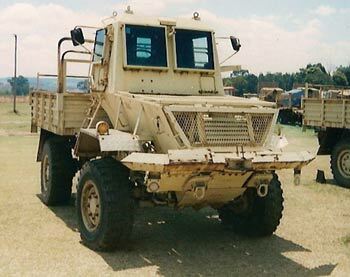 The Samil 20 Kwevoel Armoured Truck is based on the Samil 20 Mk1 and was originally produced for the SADF (South African Defence Force). It is mechanically similar to the Rhino APC, and like the Rhino is fitted with “portal” axles, (raised diffs) which provide ground clearance of nearly ½m. It is a very versatile, go-anywhere, armored vehicle, capable of transporting 2 tons. Its load bodies are secured with container locks, making it ideal for also transporting multiple, specialised loads.